Using subtle color changes to illustrate changes in elevation, Kroll's Puget Sound Shaded Relief Terrain mapping brings the region to life! 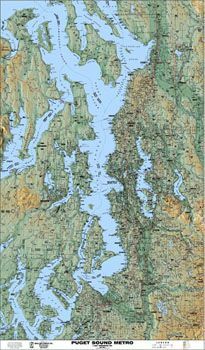 This map covers from Marysville to Tacoma, and from Bremerton to Issaquah. Shows arterials, clear town names, waterways, etc.